A fighter jet crashed Wednesday morning in a wooded area near Joint Base Andrews in Maryland, after he had mechanical trouble and steered the aircraft away from a neighborhood, officials say. A witness said the pilot's first concern was residents' safety. "I asked him if he was OK and he didn't even respond to that. He asked if everyone in the neighborhood was OK," Patrick Dodson said. 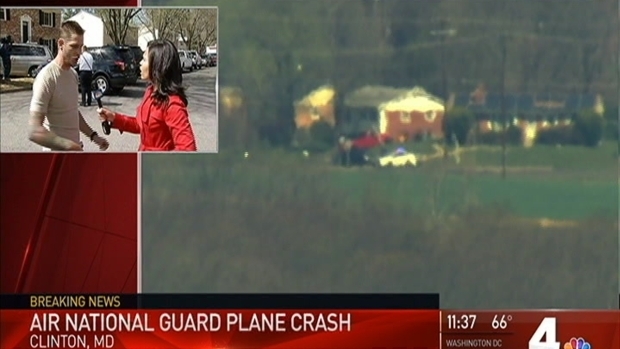 The D.C. Air National Guard F-16C fighter jet crashed about 9:15 a.m. in Clinton, Maryland, about 6 miles southwest of the base that is home to Air Force One, base officials said. Homes are about 200 yards from the crash site. The pilot, who was on a routine training mission, was able to eject from the jet assigned to the 113th Wing. He parachuted to the ground and was picked up by a military helicopter. Video captured by a witness shows the pilot drift toward the ground. 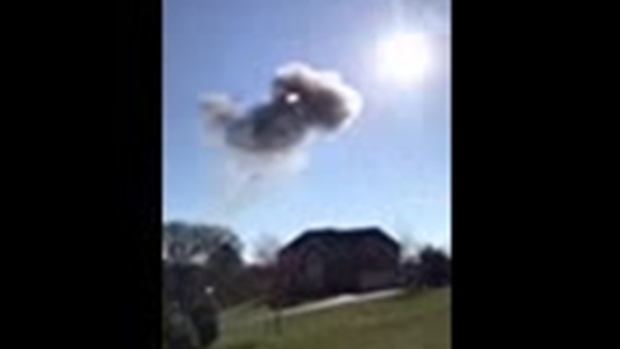 Witness video captures the moment a pilot ejects from a crashing F-16 Wednesday in Clinton, Maryland. The pilot floats to the ground by parachute. He suffered non-life-threatening injuries, officials said. The pilot was taken to a hospital for treatment of minor injuries. No one else was reported to have been hurt, according to the chief of the Prince George's County fire department, Ben Barksdale. 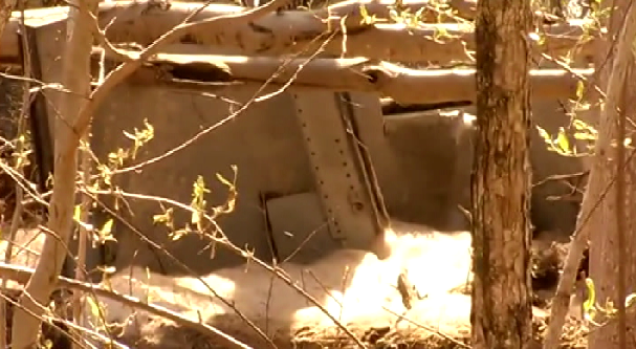 "For the pilot to be able to eject and not be injured and the plane to go down in a wooded area without affecting the homes, [we are] absolutely very fortunate that we didn't have any lives lost today." Military officials have the area, which is about 15 miles southeast of Washington, D.C., locked down as they work to learn more about what went wrong. 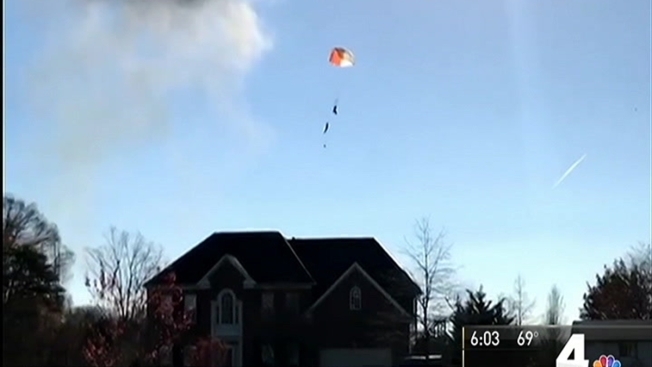 Residents said they saw the plane flying low, the pilot eject via parachute and then heard at least one huge boom. Then, they saw a plume of black smoke and smelled a fire. Dodson, who lives nearby, said he was on his porch talking on his cellphone when he heard a loud noise and then saw the plane nosedive toward the ground. "I screamed into the house, 'Get out of the house!' I thought the plane was coming here. Luckily, it landed in the woods," he said. Then, Dodson said he ran into the woods to help. He said he saw the pilot standing. That's when the pilot asked if everyone else was OK.
"He said he tried to direct the plane away from the neighborhood," Dodson said. 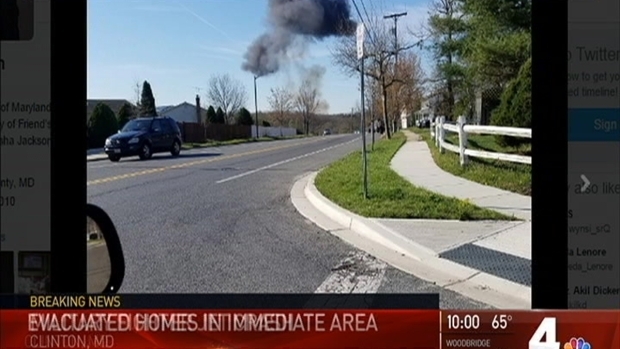 A Prince George's County man was on his porch talking on his cellphone when he says he heard the military jet crash nearby. News4's Meagan Fitzgerald reports. Then, the pilot was taken away in a helicopter. Clinton Grove Elementary School was on lockdown, and residents who were directed away from their homes were sent there. Residents were allowed to return home once officials secured the perimeter of the crash scene. The fire department is asking anyone who sees debris that could be a part of the plane to not touch it or move it. Debris has been found miles away in National Harbor, officials said. To report debris, officials asked residents to call 301-981-2002. People in the area said the impact was terrifying. "I heard a really loud boom, wasn't sure what that was; it sounded like maybe construction work. And then I heard a second boom, but it was so loud," one resident said. "My house shook, like an earthquake. But it almost sounded like a bomb." Resident Nick Bobotis said he was inside his home when he felt a boom. "I thought maybe a tree fell. So I went outside and started looking around, and then I started to smell this funny smell of something burning. It smelled like when you light a match, that first sulfur smell, and I'm like, 'That's strange.' And then I started seeing all kinds of emergency vehicles." Kent Roberson was driving through a residential area nearby when the plane crashed. "...I just heard a loud boom, I guess... like how a large tree falls and shakes the ground," he said. "That's what it felt like and what I heard." Roberson said he saw flames and smoke rising from the ground. An Air Force veteran who had to evacuate from her home said the crash scared her. "I was in the Air Force for like 26 years, so I'm used to seeing things like that, but not that close," she said. 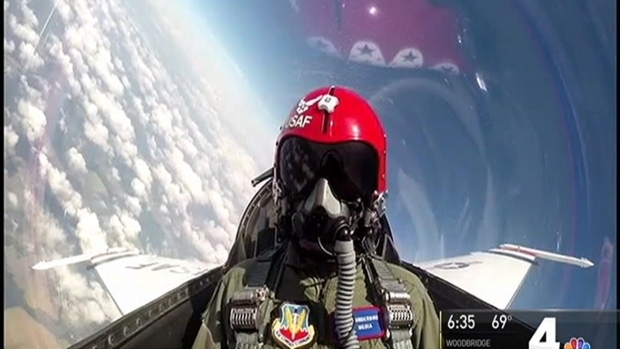 News4’s Chris Lawrence got to fly with the Air Force Thunderbirds. He offers insight into what it's like to ride in one of the fastest jets in the world. As the pilot trained, he realized something was wrong with his jet, military officials said at a news conference. "The pilot experienced a mechanical issue and immediately took actions," said Brig. Gen. George Degnon, acting adjutant general of the D.C. Air National Guard. "Once he realized he would not be able to safely land the aircraft, he made a decision to maneuver to a wooded area to avoid the risk to local community and ensure public safety." The pilot, who officials did not name, dumped the fuel he was carrying, looked for somewhere to crash and ejected. "We're talking seconds, not minutes," his commanding officer, Lt. Col. Michael Croker said about the pilot's decision-making process. The Air Force told Congress the pilot is a 31-year-old lieutenant and that an engine malfunction caused the crash, sources told News4's Scott MacFarlane. The jet was carrying training inert training bullets that were no threat to the public, officials said. No prior mechanical issues with the jet, which is worth about $20 million, had been reported, officials said. "It's quite a blessing that everything turned out like it did and nothing worse occurred," Croker said. The pilot had been released from a hospital by mid-afternoon Wednesday. "Word is he's in good spirits," his commanding officer said. The plane crashed between the Woodelves Way and Maui Street cul-de-sacs in Clinton, Maryland. The pilot landed about a mile away, on Steed Road. The crash sparked fires in the woods, which firefighters extinguished using water and foam. Some roads in the area are closed. Homes near the scene of the F-16 jet crash were evacuated as a precaution because of the possibility that the crash released hazardous materials, Mark Brady, the spokesman for the Prince George's County Fire Department, said. Authorities were knocking on doors and alerting residents. Homes near the scene of the crash were evacuated as a precaution because of the possibility that the crash released hazardous materials, Brady said. Authorities knocked on doors and alerting residents. Residents were allowed back into their homes about 11 a.m.
Hyde Field/Washington Executive Airpark, located nearby, is closed until further notice during the investigation. The 113th Wing guards Washington's airspace. They are one of the busiest wings in the country, with as many as 3,000 flights per year. NBC Pentagon Correspondent Hans Nichols gives an update on the F-16 fighter jet crash in Clinton Maryland. 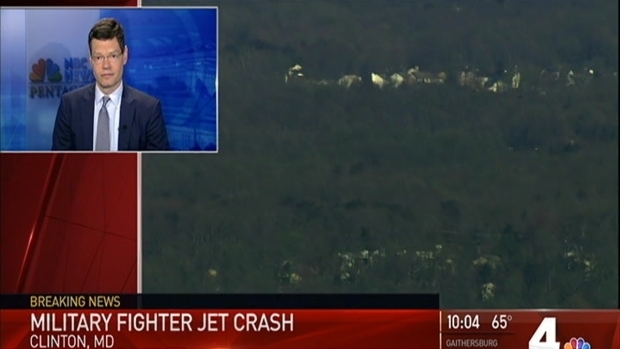 The single-engine F-16 that crashed was designed to fly fast and be agile but not to glide, aerospace expert Todd Harrison of the Center for Strategic & International Studies said on News4. "If you have a problem at a low altitude, you're in trouble," he said. "There's very little time to recover, especially if it's something catastrophic." The jets date back to the 1980s. In some cases, they are older than the pilots operating them. National Guard officials testified before a Senate committee in 2010 about their concerns with the fleet. In 2011, the Guard suggested that much of the F-16 fleet could reach the end of its service life expectancy by 2018. An Air National Guard pilot crashed an F-16 from the 113th Wing near Chincoteague, Virginia, in 2013. The jet and another jet from the same unit clipped wings. One pilot was injured after being rescued at sea. An F-18 Navy jet on a training mission crashed into an apartment complex in Virginia Beach in 2012, injuring seven people and destroying 27 apartments. The Navy said a rare dual-engine malfunction caused the crash.